Can Test Estimation Be à la Carte? In this installment of FAQ, Rob Sabourin discusses the benefits of providing stakeholders a "menu" of past projects to help better estimate their current project's testing needs. It used to be that a project manager did one thing: manage the success of the project. As IT budgets shrink and job responsibilities expand, there is no such thing as a typical project manager role. You're expected to wear many hats, facilitate human resource issues, become a subject matter expert, and assist with key technical activities. Whole team testing makes product quality everyone's business. It can also make people uncomfortable. Matt explains how this new way to approach project quality helps with leading retrospectives, conducting defect analysis, and mitigating project risks. Claire takes us on a nontraditional journey where designing and implementing testing approaches can be rapidly organized into a hierarchy of connected elements. Mind maps, used primarily for visual and conceptual thinking, may be just the answer for quality assurance professionals. Reverse Mentoring: Should Younger Workers Be Mentoring Your Executives? What happens when younger knowledge workers, the millennials, bring a new perspective to an organization? Reverse mentoring can dramatically improve employee retention, team collaboration, and the adoption of newer technology. Without clearly defined roles and responsibilities, actions taken by key project stakeholders may result in project misfires. Kyle shows what you should do to avoid the situation when roles are misunderstood, overlapped, or completely missing. In this issue's Editor's Note, Ken Whitaker kicks off the new year with a push to raise awareness of better software and how you can read Better Software anywhere on your mobile device. 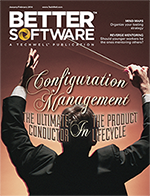 When you think of configuration management, build automation and version control usually come to mind. Dave presents a perspective that shows the important role CM plays in the entire product and project lifecycle.